Abstract: A 6 year old FS Dachshund was admitted to the ICU following hemilaminectomy at L1-L2 for IVD prolapse. Following 3 days of passive and active range of motion (P/AROM) exercises, dry-needle (MA) and electro-acupuncture (EA), and class III laser treatment (PB), the dog regained motor activity in the right pelvic limb, placing the paw during ambulation. History and Presentation: The dog presented 18 hours after jumping off the furniture, and having difficulty using the pelvic limbs. Initial examination findings on presentation found the dog to be a non-ambulatory paraparetic with absent motor activity in the left pelvic limb and only slight motor activity in the right pelvic limb and was diagnosed with a T3-L3 myelopathy. A complete blood count was unremarkable, serum biochemical profile showed a mild alanine-transferase elevation and slight hypophosphatemia. Computed-tomography-myelogram identified an L1-L2 intervertebral disc (IVD) herniation. Dorsal hemilaminectomy was performed to remove a large amount of disc material, and cord swelling and protrusion were identified. Physical Examination and Clinical Assessments: 2 hours post-operatively the dog was sedate and anxious. She had no reaction to gentle palpation of her incision site and thoracic spine, but had reaction to myofascial palpation of the lumbosacral spine and trigger points at mid-thoracic spine. Absent motor bilaterally, reduced withdraw reflex in the left pelvic limb, normal in the right, no paw placement and reduced reflexes left pelvic limb, and she reacted to toe pinch. She was assessed as a postop IVD decompression having worsening of the neurological signs in the pelvic limbs with lower motor neuron signs in the left pelvic limb. Medical Decision Making: PB of dorsal spine and incision to improve regional blood flow, increase oxidative phosphorylation, and augment analgesia and wound healing. MA to neuromodulate ANS, digital nerves, tibial nerve and local trigger points. EA to stimulate regional TL spinal nerves, tibial/sciatic nerve pathway, effleurage massage paraspinal region to improve blood flow and stimulate ANS. A/PROM exercise to maintain joint mobility and muscle strength. Differential Diagnoses: Trauma related to Hansen Type 1 IVD prolapse and surgery. Influence of opioids. Acupuncture Treatments: Day 1 postop: MA K1, Bafeng, Baihui, GV 14,20, BL 12, ST 3. Day 2 postop: Class III Laser over spinal cord and wound, MA Bafeng, ST36, KI1, GV 14,20, BaiHui and BL 25. Day 3 postop: PB over spinal cord and wound, MA ST36, GV 14, EA (Ito, alternating frequency 2.5-100-Hz) across incision and K1-GB30. Additional therapy included P/AROM exercises, analgesia/sedation (gabapentin, carprofen, tramadol, trazodone). Outcomes, Discussions, and References: Prior to the 3rd treatment the dog would only slightly pull the right pelvic limb forward during assisted ambulation exercise, and she had lower motor neuron signs to the left pelvic limb. After the 3rd treatment the dog placed the right pelvic limb during ambulation. The left pelvic limb regained more robust withdraw and spinal reflex responses, but regained only slight motor response. 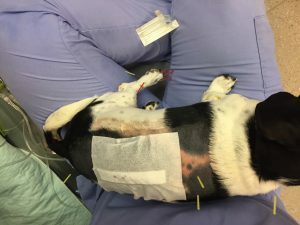 The trigger points in the thoracic spinal region were not palpable after the first treatment, and the dog appeared relaxed after each treatment. The neurological function of the right pelvic limb improved, which could have been because of the decompressive surgery and/or the acupuncture treatments. In people, inflammation appears to be more pathologic than the compressive injury for the development of neurologic signs, and acupuncture may modulate the immunologic and inflammatory response in the spinal cord. (Maigne JY, et al. Rev Rhum Mal Osteoartic 1991; 58:355–359. Martin MD, et al. Neurosurg Focus 2002;13:1–6. 35. McCarron RF, et al. Spine 1987;12:760–764.) Acupuncture may also dampen myofascial trigger points and reduced the neuropathic signs, particularly of the right pelvic limb. Manipulating the acupuncture needle at the site of insertion may have also disturbed the tissue collagen and muscle fibers, opening a communication channel for that region, reestablishing activity along those pathways. Acupuncture, in conjunction with PB, could have also augmented the dog’s comfort level; on day 3 the dog required sedation because of being overactive. The use of acupuncture to restore motor and somatosensory function in dogs with IVD disease has been rarely reported on. (Janssens LAA. Vet Med Small Anim Clin Pract 1983;37:1580–1585. 9. Still J. Comp Anim Pract Acupunct 1988;2:19–24. 10. Still J. J Small Anim Pract 1989;30:298–301. Joaquim JGF, et al. J Am Med Assoc 2010;236:1225-1229) EA is recommended for dogs classified with grade III or higher IVD disease (the dog in this case reported had a grade IV) and reported to be associated with a better outcome after 2-6 weeks of treatment with or without decompressive surgery. (Still J. Am J Acupunct 1988;26:179–187. Hayashi M, et al. J Am Vet Med Assoc 2007;231:913-918).